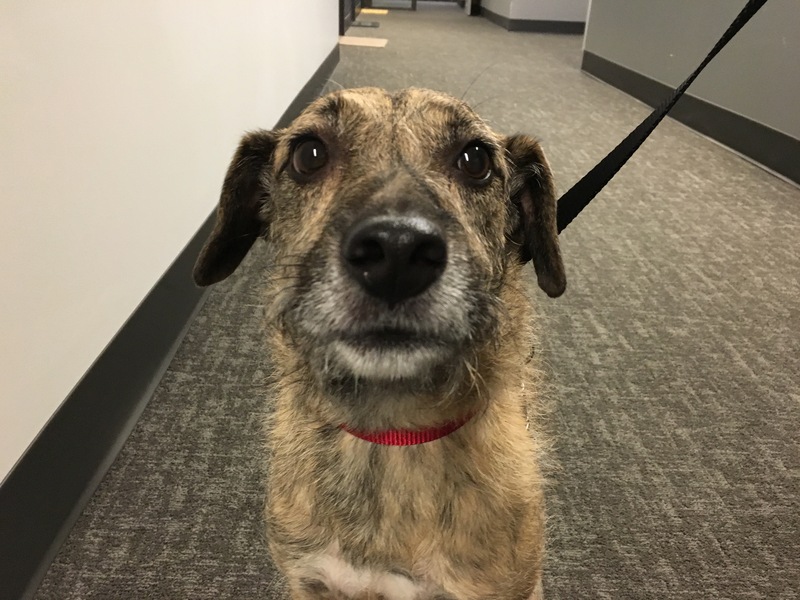 Leroy is a three-year-old Border Terrier mix who lives in downtown Omaha. His guardians set up a dog psychology training session with me to address his sever fear and anxiety to people he doesn’t know and possessive / protective behavior around one of his guardians. I was surprised that Lee Roy did not meet me at the door. In my experience as a dog behaviorist, possessive and protective dogs are very proactive in terms of meeting new arrivals the instant someone enters the dog’s home. But once Leroy’s saw me, it was instantly apparent that he was very anxious and insecure. While his overall behavior was cause for concern, I was most alarmed at his pacing back-and-forth. He clearly was looking for a place to run and hide but because of the limited space in his apartment, the dog had nowhere to go. Dogs have a fight or flight response. They will usually defer to one or the other but if that option is not available then they switch to the one that is. When you have a very insecure dog with no where to retreat to, the chances of a bite happening are much higher than in other situations. I noticed that there was a table in the corner of the living room that was not really in use. I suggested that the guardians remove the table so that Leroy could have a safe place to retreat to if he was anxious or overwhelmed. But if you have an anxious dog, having people move things around the room can often trigger an outburst. I suggested that one of the guardians take Leroy into another room so he wouldn’t see us moving things around. However as soon as the guardian moved to the door and attempted to call Leroy, he shut down. His guardian explained to me that if he thinks that he is going to leave the apartment, he stops listening and remains in place. I was going to ask the guardian to attach a leash as I have found that when you deal with really insecure dogs, sometimes the leash can help them give up control to the human. But as she was about to attach the leash, I noticed that Leroy was wearing a plastic collar with jagged edges on the inside. This is similar to a prong collar which is something that I abhor and NEVER use for any dog. Many countries have outlawed these inhumane collars. After working with nearly 2,000 dogs, I have never needed to use one. Countless studies show that long term use of a prong collar and it’s counterparts actually increases anxiety in dogs. This works against you if your goal is to build up a dog’s confidence. So if you have a dog that is anxious or nervous to begin with, using a prong collar or any of his cousins like this plastic one will make the fear and anxiety far worse. We shot the above video at the end of the session, but removed the table and started to train Leroy to use this location at the start of the session. I’m betting that within a day or two, Leroy is enjoying this new little safe place. It will be important that the guardians leave or toss treats into this new space often over the next few days while saying the command word each time he eats the treat or picks up the toy. With the furniture move complete, I sat down with the guardians to discuss Leroy’s background, behavior and how I could best help. I noticed that anytime that Leroy appeared to be anxious or nervous, his guardian attempted to soothe him with some petting and caressing. For humans, a touch when we are suffering can be soothing. But when a dog is in an anxious or unbalanced state of mind and we pet them, we are actually nurturing that unbalanced state. To help them refrain from putting Leroy when he is anxious or nervous, I recommended that the guardians start to practice my petting with a purpose philosophy. Although we had only been meeting for a half an hour at this point, these three changes should have a dramatic impact on Leroy, his confidence and behavior. Removing the collar should lessen his anxiety, giving him a safe place to retreat to should help him feel more secure and making him earn his attention and praise should boost his self-esteem. I also recommended that the guardians get Leroy a number of suitable chew toys. Most of the toys they had were soft and flexible which doesn’t make for great chewing. I suggested they pick up some antlers, goat’s horns, bones and a few rigid Nylabones of various sizes and shapes. Dogs like to chew when they are nervous so providing Leroy with a number of options will help him channel his anxiety into an outlet instead of causing him to pace, bark and lunge. Having spent a year rehabilitating a Border Terrier named Max, I am very familiar with how high energy this breed typically is. I asked the guardians how often Leroy went out for walks and learned that because of his extreme fearful nature of being outside, they walked him very infrequently. But dogs get over things by literally moving forward. Additionally, changing a dog’s environment can have a positive impact on their behavior. This is especially the case when we move from an indoor to outdoor environment. Literally moving forward for 30-60 moneys a day will help Leroy stop to focusing on his fears and have an activity to look forward to. Exposing him to the various stimuli that are encountered on walks should also provide a wonderful distraction and help move out of the dark place that he dwells in now. His guardians mentioned that sometimes Leroy was so fearful of leaving the apartment that he would poop in the hallway or elevator before they even left the building. As a result they often would pick him up and carry him to the street or car or utilize a blindfold. This is a pretty extreme case of fear and anxiety. They also mentioned that he was often so worked up that he would choke himself on the leash raising his front paws off of the ground while attempting to pull himself back to the apartment. I pulled out a Martingale collar and showed his guardian how she could add the special twist of the leash to stop his pulling and remove the pressure / choking from his neck. I spent a couple of minutes going over some leash training basics so that they would know how to lead Leroy on a structured walk using the Martingale collar. We headed out to the Bob Kerry pedestrian bridge as I didn’t want Leroy to think that he was close enough to the apartment to try to pull his way back there. Once we were out on our walk, Leroy’s body language changed quite a bit. He was anxious, but the change in scenery and the forward momentum were already having a positive impact. Leroy did fine as long as his primary guardian was with him so I had her holding the leash when we started with the other guardian on the other side so that Leroy was in between them. Halfway through the walk, I had the other guardian take the leash very subtly so that Leroy didn’t even realize that it had changed hands. When we got close to the halfway point on the walk, I had Leroy’s primary guardian linger behind with myself so that the other guardian could lead Leroy for a couple of hundred feet on his own. As soon as Leroy noticed that his primary guardian was no longer at his side, he started to slow down and pull against the leash. I had the other guardian pick up the pace and start jogging. The way a dog’s body is built, they can’t really resist moving forward and run at the same time. It took a couple of dozen steps, but eventually Leroy stopped protesting and instead jogged next to his other guardian. I recommended that the guardians start taking Leroy out for a walk every single day. I would like to see the secondary guardian eventually become the primary walker, at least until he is no longer fearful / reactive to him. By developing a relationship with the second guardian independent of his primary, Leroy should learn to be a little more comfortable with different handlers which should provide a boost to his self-esteem. For the next week or two, I suggested that both guardians take the dog out for a walk together. But halfway through the walk or sometime after they start, the primary guardian should hande the leash to the other human. After a couple weeks, Leroy should become much more comfortable with the exercise. The goal is that this activity becomes something that the dog looks forward to. We can then combine that activity with the other guardian to help develop more of a positive association with him. When we returned to the apartment, we walked in front of the building so that I could see how Leroy reacted when he was close to home. Just as his guardians said, Leroy started pulling on the leash attempting to move towards the front door to the apartment building as soon as he realized where he was. Its pretty common for dog guardians to rearrange their lives to avoid the things that the dog is fearful or reactive to. In some cases this is a sound strategy, but not in this case. I always look for opportunities to help the dog learn to grow and get past it’s fears. Because Leroy was so anxious to return to the apartment, I suggested that his guardians practice walking him in front of the building in a very measured way at least once a day so that he learns that he cannot pull or rush his way away from his problems. This was a pretty extreme case of fear and anxiety. Anytime that you have a dog so fearful that it loses control of his bowels, it’s a serious matter. By the end of the session, Leroy was nowhere near as responsive as he was before. He did react a couple of times, but his guardian was able to use the techniques and methods introduced in the session to immediately disagree with him which calmed him down right away. Timely disagreement will be a big part of his rehabilitation and transformation into a follower’s mindset. It’s going to take a week or two before the structural changes we put into place take full effect. But removing the collar, giving him a safe place to go to, incorporating rules to help him identify as being a follower and regular walks should all help him learn to stop being so beautiful in anxious. At this point I have rehabilitated close to 2000 dogs and only needed more than one session with about 13 clients. Because of how anxious and fearful Leroy is, we may need to set up a follow-up session in a month pending on how the dog response to these changes. But for now, removing the things that caused or reinforce his anxiety should have a dramatic impact on his behavior and anxiety.